Each of our cells contains a complete factory for building proteins, including the machinery for building the component amino acids and for linking them up according to information in the genome. There is also an effective system for quality control, to ensure that these proteins fold in the proper way and are discarded efficiently when their jobs are finished. Many of these quality control proteins are termed "heat shock proteins" (Hsp), because they are made in larger quantities when cells are faced with extreme environmental challenges, like excess heat. These come in many shapes and sizes, and are often named based on their molecular weight, such as Hsp60, Hsp70, and Hsp90. The Hsp70 class of protein chaperones prevent misfolding and unwanted aggregation by shielding hydrophobic segments while new proteins are folding. Hsp70 chaperones are highly dynamic proteins with many moving parts. At one end, a substrate-binding domain (shown in blue and turquoise) clamps around the target protein, blocking association with other unfolded protein chains. At the other end, a nucleotide-binding domain (shown in green) uses ATP to regulate the process. The two domains are connected by a flexible linker (shown in yellow). 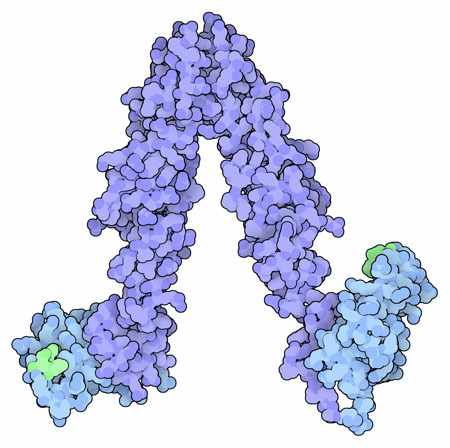 The one shown here DnaK, a widely-studied Hsp70 chaperone found in bacteria. DnaK undergoes a large change in shape as it performs its function. When it is bound to its target proteins, shown at the top here from PDB entry 2kho, the two domains are separated, and the substrate-binding domain is clamped around its target (shown here with magenta dots). When the protein chain is released, DnaK adopts an entirely different conformation, with the substrate binding domain completely open and with all the domains associated in a tighter complex. Two structures have recently revealed this amazing transition: a structure stabilized by disulfides (PDB entry 4b9q) that were engineered based on the structure of a related heat shock protein, Sse1 (PDB entry 2qxl), and a structure from PSI researchers at NYCOMPS stabilized with a small engineered loop (PDB entry 4jne, shown here at the bottom). Because they are so dynamic, Hsp70 chaperones and their partners have been challenging targets for structural study. The open form of DnaK was studied using NMR and spin labeling to define the possible orientations of the two domains, which were studied separately by crystallography. A similar hybrid method was used to explore the dynamics of the Hsp40 cochaperone DnaJ shown here from PDB entry 4j80 (for more information on this protein, see the Featured System on DNAJA1). PSI researchers at MPP have recently reported several studies using NMR to dissect the role of the linker and interaction with cochaperones in an Hsp70 protein that assists the construction of iron-sulfur cluster proteins. These types of studies solve more and more of the complex puzzle of the structure and function of these dynamic proteins. The structures of the open form of DnaK capture a key state of this dynamic protein: when it is open and ready to bind to an unfolded protein. 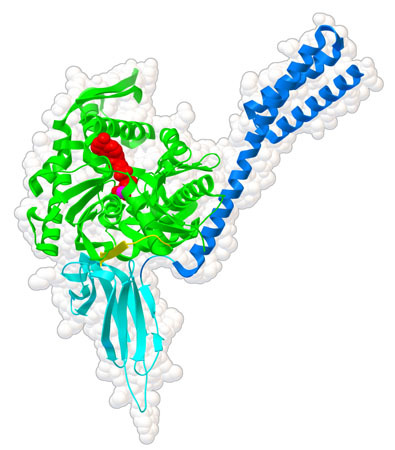 A molecule of ATP (red) is bound in the nucleotide-binding domain (green), subtly shifting the shape of the domain and guiding the opening of the substrate-binding domain (blue). 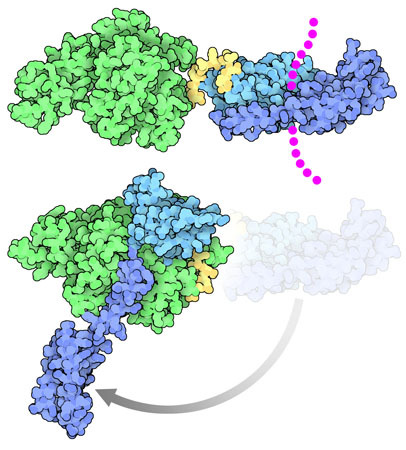 Cleavage and release of this ATP, with the assistance of cochaperones like DnaJ, will make the protein ready to bind and protect another folding protein chain. To take a closer look at the domain organization of this open form of DnaK, and the similar chaperone Sse1, the JSmol tab below displays an interactive JSmol. The structures of DnaK and the distantly-related yeast heat shock protein Sse1 are overlapped in this JSmol, showing their similar conformation in the open, ATP-bound state. The ATP-binding domain is shown in green, with ATP in red, and the two parts of the substrate binding domain are in turquoise and blue. The short linker that connects the ATP-binding domain and the substrate binding domain is shown in yellow. Use the buttons to compare the two structures and to explore different representations. Alderson, T. R. et al. The specialized Hsp70 (HscA) interdomain linker binds to its nucleotide-binding domain and stimulates ATP hydrolysis in both cis and trans configurations. Biochem. 53, 7148-7159 (2014). Kim, J. H., Alderson, T. R., Frederick, R. O. & Markley, J. L. Nucleotide-dependent interactions within a specialized Hsp70/Hsp40 complex involved in Fe-S cluster biogenesis. J. Am. Chem. Soc. 136, 11586-11589 (2014). 4j80: Barends, T. R. M. et al. Combining crystallography and EPR: crystal and solution structures of the multidomain cochaperone DnaJ. Acta Cryst. D69, 1540-1552 (2013). 4jne: Qi, R. et al. Allosteric opening of the polypeptide-binding site when an Hsp70 binds ATP. Nature Struct. Mol. Biol. 20, 900-907 (2013). Saibil, H. Chaperone machines for protein folding, unfolding and disaggregation. Nat. Rev. Mol. Cell. Biol. 14, 630-642 (2013). 4b9q: Kityk, R., Kopp, J., Sinning, I. & Mayer, M. P. Structure and dynamics of the ATP- bound open conformation of Hsp70 chaperones. Mol. Cell 48, 863-874 (2012). 2kho: Bertelsen, E. B, Chang, L., Gestwicki, J. E. & Zuiderweg, E. R. P. Solution conformation of wild-type E. coli Hsp70 (DnaK) chaperone complexed with ADP and substrate. Proc. Natl. Acad. Sci. USA 106, 8471-8476 (2009). 2qxl: Liu, Q. & Hendrickson, W. A. Insights into Hsp70 chaperone activity from a crystal structure of the yeast Hsp110 Sse1. Cell 131, 106-120 (2007).